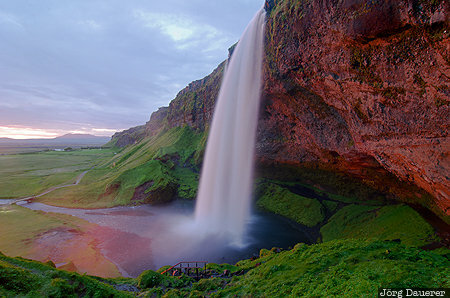 The waterfall Seljalandsfoss back-lit by the setting midnight sun. The motion of the water is made visible by choosing a long exposure time. Seljalandsfoss is in Suðurland in the south of Iceland. This photo was taken in the evening of a sunny day in June of 2012. This photo is part of the exhibition Waterfalls of Northern Europe (Oct'14). This photo is in the Photo Calendar "Iceland". This photo was taken with a digital camera.